Less Drag, More Thrust and most important Less Strength is Used. The Split Fin Design is not only unique; it uses the Latest Technology in Composite Plastic Polymer Materials to give a Light Fin (Great Travel Fin) and one that Increases Thrust and Reduces Fatigue. Fin is equipped with EZ-LOK Squeeze-Style" Quick-Release Buckles which Snap-On-and-Off with Ease, yet Will-Not Disengage- Accidentally, and the Spring Strap that Automatically Compensate for Boot Compression and Adjust with changes in Depth. The Spring Straps are Rust-Resistant Stainless Steel Springs were designed with Variable Pitch Geometry. 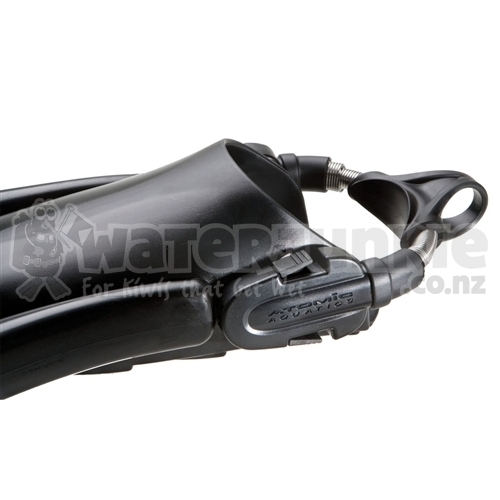 Divers get a more Comfortable Fit and Easy One-Hand Removal with the Large Rubber Thumb Loop, yet the springs are Resistant to Deformation if Overstretched. 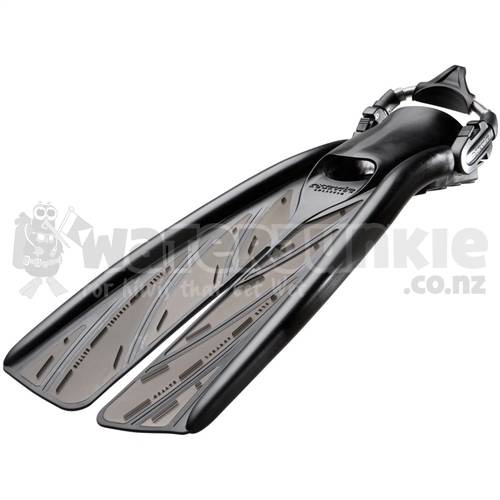 Included on the "Smoke on the Water" Split Fin and available for all Atomic Split Fins or as a Universal Retrofit for other Brands (see SKU: ATMFSS). Extensive R&D and Testing yielded the perfect formula of Flexibility and Rigidity for Efficient Propulsion. Atomic Multi-Composite Plastics result in a Powerful Kick that requires Less Effort, Stress and Strain meaning Less Air Consumption. The Power Rails are Highly-Resilient and Perform as the Backbone of the Split Fin, Storing and Releasing Energy with Every Kick. The Semi-Ridged Flex Battens set in the Soft Elastomeric Blade, Control the Precise Wing Shape to Optimize Thrust and Reduce Drag. The Large Surface Area Blade Improves Pivoting, Turning and Alternate Kick Styles. Thin, yet Strong and Highly Flexible Hinge Points between the Semi-Ridged Battens cause the Blade to React Quick-and-Efficiently to the Slightest Kick. The Anatomically Contoured Open Heel Foot Pocket designed to Fit-your-Foot without Stress Points, with Semi-Open Toe for added Comfort. The Internal Sole Plate creates Ridged Platform Beneath-the-Foot for Greater Power Transfer to the Blade yet provides a Soft, Comfortable Foot Pocket. 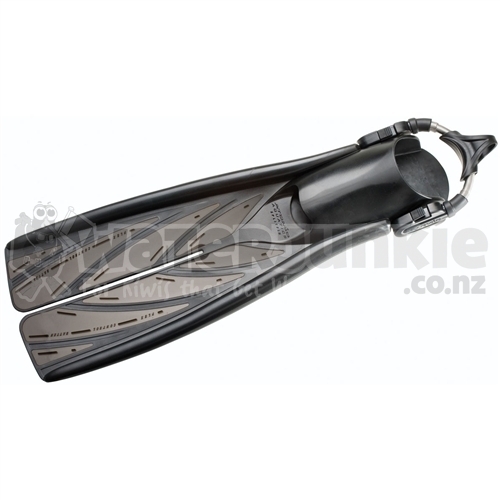 Fins are available in sizes Small, Medium, Large or X-Large are Black in color and are covered by a 12 month limited warranty. So make the switch and use less effort which equates to less air usage and longer more comfortable dives.